** Draft, written in 2010. The completed and updated article is now published. Soundwalking is a creative and research practice that involves listening and sometimes recording while moving through a place at a walking pace. It is concerned with the relationship between soundwalkers and their surrounding sonic environment. The term was first used by members of the World Soundscape Project under the leadership of composer R. Murray Schafer in Vancouver in the 1970s. However, this group was not the first to orient themselves to an area by sound and to record the sounds of the environments that they walked through. This article documents some earlier examples of works produced by walking while audio recording, and situates soundwalk research and creation in relation to soundscape studies. It then explores several contemporary approaches to the practice of soundwalking, and includes an analysis of variations on a soundwalk in Queen Elizabeth Park, Vancouver; a site which is important since it was the subject of Hildegard Westerkamp’s early article on soundwalking. Decisions about the location, style, content, and montage of sound in a soundwalk have political, social and ecological consequences. Soundwalks take place in urban, rural, wilderness and multiply mediated locations. A soundwalk can be done individually or in a group. It can be recorded or not. It can be re-situated in the same location, or translated into other media forms with little or a great deal of sound processing. Soundwalk artists maintain differing attitudes toward the place in question, sounds recorded, processes used, audience of the walk itself, and the audiences of interpretive pieces based on soundwalks. Their intentions may be aesthetic, didactic, ecological, political, communicative or some combination of these. This article will attempt to tease out the characteristics of these proliferating contemporary approaches to soundwalking. In this article, soundwalking is distinguished from other kinds of mobile listening and field recording practices that are not so closely linked to the act of walking, which is a particular kind of movement through a place. The practice of listening while walking has a long history in philosophies of walking (Thoreau 1862; Schaub 2005), as well as practices of walking meditation, in which attention to listening figures prominently (Thich 1996; http://www.egreenway.com/walking/walk9bib.htm). Soundwalking can be situated in relation to long-standing artistic, philosophical and political concepts that theorize through the practice of walking, such as haiku poets’ use of daily walks as a creative structure, writing about the figure of the flaneur and the situationist concept of the dérive, as well as the approaches of conceptual artists, such as those in the Fluxus movement. Since the term soundwalking focuses on the act of walking, it could be understood to exclude those who are not able to walk and require wheelchairs or strollers. While some walks are planned to allow access to such conveyances, this is not always the case. Wilderness hiking trails are particularly exclusive in this respect. This is not the only exclusion fostered by a choice of such a location. When soundwalks are planned in remote locations that require participants to use individual transport to get there, such choices have political implications: as Alexander Wilson (1998) points out, access to wilderness parks is the privilege of the middle class who have cars. He notes that in some cases, roads to parks were designed with bridges that exclude public transport, a move which explicitly excluded those who do not have cars; while in many others there are no public buses or trains that will take people directly to parks. Because of the association of soundwalks with the World Soundscape Project and the northern pastoralism of its founder, R. Murray Schafer, wilderness parks have been a favored location for soundwalks. However, in recent years, there has been an increase in public walks and soundwalk research projects planned in accessible locations associated with music festivals and urban sonic research groups. A walking pace (andante, 75 beats per minute, like that of a relaxed and active heartbeat) is slow in musical terms, slower than the pace of the sound-cyclist, the sound tourist, the sound safari; it is a reflective pace. While recording, even slower movement –andante grazioso, 60 bpm — is often necessary to reduce wind on the mic. The walk is slow movement, where stillness is only temporary and motion is more or less audible. In many soundwalk recordings, it is possible to hear sounds of the recordist, traces of breath, gait, touch and presence that are more often effaced in still recordings. This emphasis on slowness, human movement and a focus on particular places brings attention to the presence of the soundwalkers and their ways of interaction in that place; also it can be considered an ecological act in its reduction of carbon and acoustic footprints to local and accessible places. However, this depends on decisions about where to do the walk. If someone plans walks in their own neighborhood, this can facilitate a focus on local concerns and politics. The focus on the everyday noises of a place and their “wild” interaction, as well as the inclusion of traces of the moving presence and perspective of the recordist, goes against the grain of early ideologies of sound recording, which developed around the sound studio (or sound lab). In the studio approach, sounds are isolated from each other and from the outside world, in order to provide a favourable signal to noise ratio and to make sounds easier to control and edit (Thompson 2002, p. 7). In the studio, noise is considered a problem to be baffled, and in everyday life, noise is something to be avoided, blocked out or ignored. In soundwalks, noises and their relationships can be the focus of attention and participants can be asked to consider their place in the soundscape and their cultural significance in that context. This ideology of considering all sounds, including those usually discounted as noise, is similar to that of John Cage, who said that the use of electrical instruments “will make available for musical purposes any and all sounds that can be heard” (1961: 4). Soundwalks take the everyday action of walking, and everyday sounds, and bring the attention of the audience to these often ignored events, practices and processes. Figure and ground can be shifted, in a way that is potentially paradigm-shifting as well. It is important to note that many of the major figures in the field of soundwalking are women, unlike with many other areas of electroacoustic sound art and research, indicating possibilities for changing gender dynamics in relation to sound and technology. Some soundwalks shift power relationships between artists and audiences, acknowledging the varied listening experiences and knowledge of audience members. A tradition of public group soundwalks is now associated with many music festivals and conferences, and these are sites for group listening and discussion that are often unusual in their openness and accessibility. In discussions following the walks, audiences can be encouraged to express a wide range of responses, including musical elements of the sound environment heard, comments on who controls the sounds, the history of that particular sound environment, and associations with other sound environments. People who may feel they are not entitled to speak about contemporary music since they lack musical training seem more likely to engage in such wide-ranging discussions, and audiences remark on what they learn from others’ responses (McCartney 2008). Some soundwalk artists have extended this communicative approach that can be considered mutually conscientizing (Freire 1994) to interactive installation work and other forms that emphasize artist-audience communication. Soundwalking has been translated across media for radio, gallery installations, and the internet. Recently, the concept of soundwalking has expanded into several variations on the idea, such as shadow walks, electrical walks, blind walks, audio walks, tourist walks and listening walks, each of which will be discussed later in this article. In addition, the value of soundwalking as a method of research creation is now understood in areas such as social work as well as in contemporary art and soundscape research. Derek Lang’s photo of a recording soundwalk led by Andra McCartney on May 27, 2007 during Deep Wireless radio festival, presented by New Adventures in Sound Art. Practices of walking narratives have been used as methods of orientation and cultural knowledge-making for aeons. Bruce Chatwin’s The Songlines discusses oral walking narratives that the Aboriginal Australians linked to routes through the landscape to orient themselves physically and spiritually, continually singing the world into existence (1987: 2). Prior to the invention of sound recording technologies, literary perspectives on aural landscapes could occasionally be found in diaries, letters and creative writing. However, it takes significant research to find and collate literary sources for a particular location throughout history. In the 1970s, the World Soundscape Project received substantial research grants from the Donner Canadian Foundation, the Canada Council and UNESCO, to do soundscape research. This funding allowed them to provide a historical perspective on changes in the Canadian and European sound environments in times prior to sound recording, for instance in the Vancouver Sound Diary (1977a). The works of literary flaneurs in nineteenth century Europe documented changes in daily life during industrialisation through a method of walking through cities. While these documents were primarily from a visualist perspective (Gleber 1999), occasional references were made to sound. Clues about the sound environment in different historical periods can also be found in visual art pieces. A thoughtful link between sound and visuality is made in the Paris Soundwalk: The Louvre by the World Soundscape Project, in which listeners are advised to listen to paintings. The documentation of this walk includes reproductions of the paintings along with questions for the listener about how the activities depicted in them would sound (1977 b, 86-91). The invention of sound recording technologies at the end of the nineteenth century opened up the possibility of doing audio recording during walks. As noted earlier, sound recording is primarily undertaken as a studio practice isolated from environmental sounds that are considered problematic noise. Early instances of sound recorded outside the studio include dialogue recording for film, and ethnological recordings, although usually the latter were still recordings made with portable equipment, not moving recordings. The most common use of sound recording with movement was during a tracking shot in a film shoot. It is not surprising then that an early example of mobile sound recording was done with a film camera, while another involved recordings made for Folkways, whose primary holdings are ethnological. Walter Ruttman used a film camera to do the field recording for the sound piece “Weekend” in 1930, in which urban sounds are montaged. His interest in exploring the rhythms of urban life in sound owes much to his earlier, rhythmically edited silent film documentaries such as Berlin: Symphony of a Great City (1927). Schwartz was then asked by Folkways Records to produce a number of albums devoted to the sounds of everyday life: “My material enabled a listener to experience actual sounds — sounds that served vital communicative functions in people’s lives.” (Schwartz 1974: xiii). Most of these recordings were made within a few blocks of Schwartz’s home in New York, maintaining an emphasis on a local neighbourhood that is echoed in the work of some contemporary soundwalk artists. The Fluxus movement has used scores for walks, although these are not specifically marked as soundwalks (see for instance Fluxus walk 1962-2002 http://www.mail-archive.com/fluxlist@scribble.com/msg10417.html). It is more difficult to find recorded examples of sound-oriented walks created by conceptual artists. Adrian Piper’s early conceptual sound work Streetwork Streettracks I-II (1969) began with a sound recording of a walk along a city street in New York. 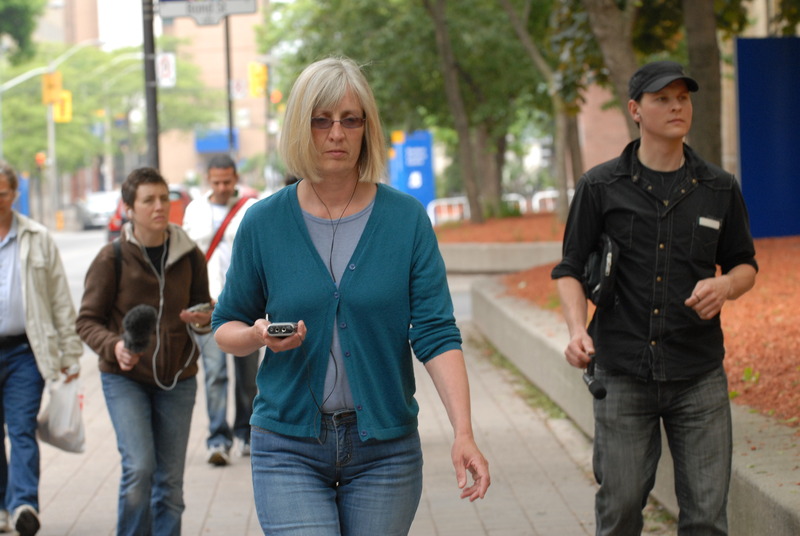 Then the following week during a festival she did a simultaneous recording of a walk along the same route, during which she engaged with the public while playing back the earlier solo walk at double speed, bringing attention to the technology and creative process while inviting dialogue in the new recording. Prior to the introduction of light, portable sound recording technologies such as the Walkman, the act of recording soundwalks while moving through a place was relatively cumbersome, as Tony Schwartz notes above. Until the 1970s, there was no practice defined as soundwalking as such: practitioners came from such fields as audio documentary (such as Schwartz), film (Ruttman) or conceptual art (Piper). In the 1970s, prepared by the artistic work and political ideologies of the Fluxus movement in New York and the Situationist movement in France, both of which emphasize a focus on art from everyday life, two major research groups began more sustained work in researching and recording sound environments, providing more possibilities for collaboration, exchange and publication. In the 1970s, sustained attention to walking in a research project, as well as the interdisciplinary study of sound in environments, was established through the work of Jean Francois Augoyard at the research centre CRESSON, in Grenoble, France. Also beginning in the 1970s, soundwalking and the study of the soundscape were investigated by R. Murray Schafer, Hildegard Westerkamp and other researchers at the World Soundscape Project in Vancouver, Canada. CRESSON is the Centre de recherche sur l’espace sonore et l’environnement urbain, a laboratory founded in 1979 in Grenoble, expanding on work begun earlier that decade by J. F. Augoyard and others. Their interdisciplinary research interests include acoustic architecture, urban acoustics, anthropology of space, the sonic environment, urban sociology, and theories of architectural and urban ambiances. Augoyard is a philosopher and musicologist, and was director of the institute for several years. His doctoral dissertation, originally published in 1979 as Pas a Pas: Essai sur le cheminement quotidien en milieu urbain, is a methodological and theoretical consideration of ways of walking in an urban environment, focusing on a specific location (the Arlequin neighbourhood in Grenoble, France) and referring directly to the testimonies of inhabitants in order to develop a rhetoric of walking, an early example of reflexive research methodology in which the ideas and experiences of research subjects were acknowledged within the research enterprise. Augoyard was a good friend of Michel de Certeau, whose influential theoretical essay Walking in the City (from The Practice of Everyday Life, 1984) benefitted greatly from the insights developed by Augoyard during his project about walking, including the consideration of the rhetorical figures of synecdoche and asyndeton as they are configured by walkers in urban space. Augoyard’s ground-breaking work has only recently been translated into English (Augoyard and Torgue, 2005; Augoyard 2007). In more recent years, research on experiences of sound and other ambiances in urban environments is carried out by a growing team of CRESSON researchers including notably Pascal Amphoux, Jean-Paul Thibaud, Nicolas Tixier, and Rachel Thomas. An evolving collaborative research website (http://www.ambiances.net/) includes writings in both French and English. The Soundwalking radio show at Co-op Radio in Vancouver was based on ideas about soundwalking that Westerkamp developed while working with the World Soundscape Project. Prior to beginning this show, Westerkamp wrote an article that discusses her approach to soundwalking, and uses an example of a soundwalk in Queen Elizabeth Park, Vancouver as a kind of score, describing aspects of the park environment and suggesting questions for a soundwalker to consider while doing the walk. The article that Westerkamp writes about Soundwalking establishes an imaginary dialogue with the audience through describing different areas of Queen Elizabeth Park, and asking direct questions to the reader that are not just focused on sound but extend to all the senses. For instance, when discussing the Conservatory, Westerkamp asks: “When you walk into the conservatory, you are entering an artificially created, tropical environment … Does it look and smell and feel tropical? Does it sound tropical?” (Westerkamp 1974: 21) The article grounds Westerkamp’s ideas about soundwalking through a specific site that the audience is encouraged to explore in their own ways, with her suggestions and questions as guides. The article then functions as a kind of score for potential soundwalkers. Like a Fluxus score (Friedman 2009) it provokes the audience and suggests that they engage in certain activities, in this case listening and analyzing as they walk through a place, or making sounds by activating surfaces. However, it is more elaborated and didactic, with much longer discussions than the usually terse Fluxus score. The Soundwalking show at Co-op Radio gave Westerkamp a forum to further explore some of her ideas about sound ecology. As with the Soundwalking article, her intention with the Soundwalking radio show was to take listeners to various locations not far from their homes, in the Vancouver region, then to play back the sounds of these environments to listeners, framing and contextualizing them through on-air commentary. Sometimes, as in a program about Lighthouse Park, she would read excerpts of others’ writings (in this case, Emily Carr). The radio shows often had a political point made acoustically. For instance, the show “Silent Night” contrasts the name of the Christmas carol with the reality of acoustically crowded reverberant urban shopping malls in the weeks before Christmas, juxtaposing cash registers and holy music; “Under the Flightpath” repeats the words of residents saying they don’t hear the planes any more, with the roaring of jets overhead. Westerkamp notes that the radio show gave her experience in field recording in a wide variety of different sound environments, as well as experience in communicating with the radio listener from the recording location. These soundwalks use various techniques to reach the radio listener. She includes commentary on inaudible aspects of the environment, in order to maintain contact with the radio audience and situate the soundscape. “Sort of like a sports announcer, I was the link between the audience and the radio station. But it was much more slow-motion than being a sports announcer, it was more contemplative, meditative, depending on which environment I was in” (Westerkamp interview with McCartney, April 1993). Westerkamp remembers that she gained technical competence through producing many shows, not only about the equipment, but also about interacting with environmental sounds, and talking with people. At least part of the reason that Westerkamp develops a non-intrusive style of recording at this point is that she is very aware of her position as a newcomer to Canada, since she immigrated from Germany in 1968. Renato Rosaldo (1988: 85) describes immigrants to North America as bobbing and weaving between assimilation to the new culture, and allegiance to their original one, creating for themselves a border zone which resembles both yet is part of neither. The immigrant’s experience necessarily includes a sense of displacement, one in which there is rarely any permanent return to the place of birth, and therefore there is a need to become part of the chosen culture. At the same time, the immigrant’s formation in the home culture invites comparisons between the cultures in order to understand how to fit. So the immigrant swings between the two poles of home and chosen culture, bringing together aspects of both in their experience. As she learns about the Canadian soundscape with an immigrant’s displaced ears, Westerkamp is at once inside this new soundscape and outside it, able to hear with a fresh perspective. But perhaps more importantly, her experience as an immigrant leads Westerkamp to the use of the microphone as a tool of access, and the development of a dialogic approach to field recording and production that would become a significant part of her style, bridging cultures in sound. She uses the microphone, with the justification of a radio show, to go into situations that she may not otherwise have entered, allowing her to learn about a new culture through listening. Entitlement to explore public places through sound technology is important to consider in relation to other processes besides migration. It is notable that many of the best-known practitioners of soundwalking and related practices, such as Westerkamp, Corringham, Cardiff and Kubisch, are women. This is unusual in electroacoustic soundmaking practices, which tend to be dominated by well-known male figures. The microphone, as a means of recording, as a technological barrier that stands between me, my body and this man, ultimately marks my body as being off limits. By refusing to stop recording, reclaiming the agency I normally feel while recording, I shift the dynamics between us, forcing him to get back on his bike and ride away quickly. Linda McDowell (1999), a feminist geographer, insists that a woman’s presence on the streets, particularly at night, is always complicated by her gender. This gendered position always marks her visibility, making the notion that a woman can observe quietly, detachedly almost impossible. (Gabriele in McCartney and Gabriele, 2001). Soundwalk work is far from detached. The recordist’s perspective is written into the recording, into the listening, touching, experiencing and moving through the space, so that soundwalkers are simultaneously flâneurs and not flâneurs. As wandering explorers and documenters of city life, soundwalkers seem like flâneurs. But a recording soundwalker is at the same time an intensely engaged listener, connected by a phonic umbilicus to the surrounding world. At the moment that Gabriele met this passing cyclist, he asked her to stop recording, to stop inscribing her sonic presence in this context. Her refusal, and the agency she insists on by continuing to record, are important parts of the soundwalk recording experience, and the sense of entitlement access to such technology can provide. The aims of a recording soundwalk by an individual soundwalker are often different from the aims of public group walks. Acoustic ecologist Gregg Wagstaff distinguishes between soundwalks, in which participants are actively encouraged to make sounds during the walk, and listening walks, during which participants are asked to stay as quiet as possible (2002a). In common practice, the term soundwalk is often used rather than listening walk to refer to a silent public walk, often given free of charge at festivals and conferences, which is led by a guide with the intention of encouraging active listening among a wide audience to the surrounding sound environment. Participants in such a walk often are asked to stay silent for a number of reasons. The ear hears the frequency range of the human voice most clearly, and will focus on voices to the exclusion of other sounds. Culturally, people are pre-disposed to focus on languages that we understand, which leads to less available attention for other sounds. Also, a silent group has a kind of presence that is remarkable, drawing attention of others to the listening activity as it happens. Group silence in such cases is followed by conversation: these public walks are followed by reflective discussions that are wide-ranging in subject and tone, and can be used in the design of future soundwalk experiences. In the last year, in the research group in Montreal we have begun recording soundwalk discussions for research purposes, because of important insights about soundwalks by participants that can be connected with soundscape theory. For instance, some walkers find the silence to be an unacceptable constriction of personal agency, resulting in the development of walks that include smaller and larger group work with varying degrees of silence and discussions at several points. In another discussion, after a recent urban walk, comments consistently referred to the vitality of a noisy street shopping area as a favourite part of the walk, which reminded me of Kreutzveld’s (2006) discussion of the work of urban theorist and activist Jane Jacobs, and her writing about urban vitality as an important theme. Derek Lang’s photo of a blind listening walk led by Nadene Theriault of Sound Travels in Toronto in August 2007, presented by New Adventures in Sound Art. Though not central to his acoustic practice, Francisco Lopez’s blind walks cultivate relationships and listening strategies that change power relationships between sighted and unsighted people. Performed under the theme of “Invisible Cities” for Champ Libres International Symposium, City Art Technology 2006, these soundwalks allowed for sighted participants in Montreal to be guided through the city by someone who is blind. Afterwards participants would also enter an art installation space where they remained blindfolded and continue actively listening to distorted audio recordings of local soundscapes. Participants signed up in the atrium of the library, where they would be blindfolded and assigned a unsighted guide who would proceed to lead them through the vibrant Latin Quarter district surrounding the site. Where Wagstaff is concerned with the presence of the silent group in public, here the focus shifts to the interpersonal relationship developed between individuals of two very different listening groups, and how they acoustically relate and communicate in this public space. Lopez states that “it works as a piece/experience that explores the possibility of transferring apprehensions of the world through the interaction of people living in different perceptive universes and through the direct exposure to real and virtual sound environment” (Lopez, 2006). By blinding the participants and having them guided by unsighted experts on acoustic orientation Lopez highlights the ocular-centric experience of even active listening for most people. The practice also hints at such adages as “the blind leading the blind”, which often have derogatory connotations and biases. Here, assumptions that may even subconsciously exist about such listening groups as the blind, are challenged and reworked for the participant. Westerkamp’s Soundwalking show was always connected directly with the place of recording. The radio listeners lived in Vancouver, where the recordings were made. During or after listening to a show, they could do a soundwalk in the same site and hear how it sounded. Soundscape theorist Murray Schafer was concerned about how the mediation of sounds as they are dislocated from their source make them schizophonic (a term invented by him that means sound split from its source, that can also imply schizophrenia and mental disassociation). However, schizophonia can also lead to schismogenesis, or the birth of new perspectives, as Steven Feld points out (1994). Putting interpretations of soundwalk experiences into different historical and geographical contexts can lead to further insights. After reading Westerkamp’s 1974 article on soundwalking, I asked her to repeat that soundwalk with me in 1997. I then listened to the recording from the 1997 walk, and wrote about that soundwalk in relation to the original article, focusing on historical changes. A number of decisions were made in the design of this walk and its subsequent presentations. Firstly, location: it is at Queen Elizabeth Park, which Westerkamp wrote about, and which is therefore accessible for comparison and analysis. Secondly, recording technology: a DAT recorder for clarity (the best quality portable recording in 1997) and a large, visible shock-mounted microphone. Two still cameras were used for photographic documentation of the walk. Thirdly, style of walk: two listeners, one recording audio (Westerkamp) and the other doing photographic documentation (McCartney), occasionally conversing with others or announcing the date and weather, but mostly silent; moving through the areas of the park identified by Westerkamp in the article. Fourthly, form of presentation: an interactive gallery installation, website and short radio pieces using sound and images from the walk that were transformed using asyndeton and synechdoche to produce short (one to three minute) multimedia works, and inviting commentary from the audience. The areas of the park delineated in Westerkamp’s article are the parking lot, the lookout, the conservatory, the quarry garden and the creek. Even though we discussed these areas as if they were discrete, in the recording there are segues or border regions rather than the rigid boundaries that appear on a map: walking down from the lookout into the quarry of the sunken garden, for instance, the acoustics subtly change over time becoming more enclosed, the sound of the waterfall gradually increases and the sound of the drummers diminishes. The approach to production with the soundwalk was different from Westerkamp’s approach in her radio show (for an example, listen to Lighthouse Park Soundwalk, 1977. http://cec.concordia.ca/Radio/Long/Westerkamp.html),. While her radio pieces maintain the timing and flow of an original walk with very little editing, in this case the work interprets and condenses the walk, with the intention of making shorter pieces that would suit the memory restrictions of interactive and online venues, using asyndeton and synechdoche as compositional strategies. Asyndeton is “the deletion from the perception or memory of one or many sound elements in an audible whole” (Augoyard and Torgue, 2005: 26). It is a matter of not hearing, or forgetting parts of a sonic whole. It is a complementary process to synechdoche, in which one specific part of the soundscape is valorized by selection (Augoyard and Torgue 2005: 123). The processes are complementary because in order to valorize one part, a listener has to forget about or pay less attention to others. While these processes are both important to memory and perception, they are also involved in sound production, and were used to structure the Queen Elizabeth Park pieces created for the installation, website and radio works. Ellipsis is used: short sections of sound are selected through time and cross-faded together to create shortened versions of a walk through an area (twenty minutes becomes two minutes). Particular moments are valorized because of their sonic potential, and highlighted using pitch-shifting, frequency filtering, panning and amplitude changes to create more abstract work. No attempt is made to re-situate the recordings or to provide a paced audio guide to the park. A copy of the soundwalk tape was given to artist P. S. Moore. He began producing a series of drawings, paintings and sculptures, based on his listening to the soundwalk and to abstract compositions based on it. The images were related to each of the sound files by referring to James Tenney’s ideas about music and gestalt perception. Significant changes in the tempos, timbres, pitches and harmonies of the sounds determined how the images in the installation would change over time. For instance, in the Sunken Garden area, while approaching the waterfall, timbral density and amplitude both increase. The associated imagery becomes increasingly layered, with concentric rings that allude to the regular rhythm of the drums, and excerpts from photographs of the water that emphasize its quality of timbral or textural complexity. Both imagery and sounds reflect on listening, through abstraction, based on the experience itself. Finally, each composition was completed and connected to a map on the computer screen, which was based on the map from Westerkamp’s article. Audience reponses were collected and displayed on a computer in the gallery space. I appreciate your recognition of the space around you, not only within your multi-media exploration, but of your occupation of the gallery space itself. The connection of the objects, images and studies which you have introduced into the ‘environment’, and their evidence on the walls in markings, etc., serve to heighten the levels of interaction and communicative exchange on levels which refer back to and heighten and expand those issues of space, landscape, experience and communication addressed in the video and multi-media work. I am far less isolated in the space than I expected to be. Tara says that the installation “made you feel as if you had really visited Vancouver and the park.” Several people at both the York University and the New York versions of the installation said that it reminded them of visits that they had previously made to Vancouver. Marcia’s comment is interesting: she says that she would like to visit the park some day “to see how my perceptions of the second visit differ from the first.” Here, she is explicitly referring to her visit to the installation as a visit to the park itself. Wendy makes an important point when she describes this as “a unique experience of a day at a park … that enables the viewer to be there with her.” This construction of Queen Elizabeth Park is one based on a particular recording made at a certain time on a soundwalk by two individuals. The recordist’s perspective influences how a soundwalk recording will be created and transformed, and how it will sound to the audience. The interpretation of that experience depends on each audience member, and their memories and experiences. Some other audience members write about the installation as futuristic. John describes it as portraying “a normal and serene setting in a particularly futuristic manner … you can experience what it feels like to be in a place without really being there.” He continues by adding “This idea bothered me a little.” Although John does not elaborate about why this idea bothered him, perhaps it could be because virtual worlds can seem a replacement for physically going somewhere. At the same time, Michelle suggests how this could be enabling: “someone who isn’t able to travel could view the sights and listen to the sounds on the computer.” Audience responses to this work voice some important questions, such as how gallery installations are related to the environments that inspired them, how hearing recorded sounds and pieces based on them leads to reflection on the significance of daily sounds that are often ignored otherwise, and how technology facilitates and constrains the documentation and representation of an experience. As well as the interactive installation, a didactic website was produced (McCartney 2000) that compared the two walks (1974 and 1997) with the intention of developing both historical and geographical dimensions, discussing the soundwalk as it had changed over time and the park as an example of an urban post-industrial park (it was originally a quarry). This included short pieces that excerpted and cross-faded short sections of the walk. The pieces were kept short for greater public access since many people do not have high-speed internet. This website was later used by the British Educational Communications Technology Association as a resource for music education at the public school level (BECTA 2003). Students and teachers at the schools read about soundwalks on the website, listened to the excerpted pieces, and then designed and performed soundwalks around their school areas. The wide reach of this activity was supported by significant government funding and infrastructure in the UK. Early in this century some attention began to be given to the range of approaches used in soundwalk work. A soundwalk website was developed by the Canadian Electroacoustic Community, bringing together the recorded walks and ideas about soundwalks of several authors, such as Steven Feld, Dallas Simpson, Victoria Fenner, Hildegard Westerkamp and others (EContact! 2002). At the same time, practices based on walking and involving sound began to emerge from the visual arts and from music performance. These are not called soundwalks by the artists or musicians, yet some of these approaches are often grouped with soundwalks in discussions of the work (see for instance LaBelle 2006; Licht 2007). Kubisch draws attention to the ubiquity of electricity by making it audible, an approach that is a bit different from the noise awareness activities of sound ecologists in its focus on the inaudible, but similar in its attention to contemporary waveform pollution. Camino is a performative sonic pilgrimage and the aural record of a 1000 kilometer walk by violinist Oliver Schroer, his wife and two friends, in May and June of 2004. They walked the Camino pilgrim trail through France and Spain, and Schroer played his violin in churches along the way. The pilgrims carried a portable recording studio. Since permission to play in these spaces was often tenuous, Schroer always felt he could be stopped at any moment. Playing sometimes for several people and sometimes for a single listener, each space lent a different character to the performance: “The sense of place is strong here – pilgrims praying, children playing, birds, bells, footsteps, passing snatches of conversation, the sounds of the buildings themselves. Each space has its own distinct character and resonance (liner notes, 2005).” Mixed around and between the violin tracks on the CD of the Camino experience are soundscape pieces that move between different spaces: “Moissac Bellswirl. On this day in Moissac an organ was playing in the cathedral and the bells were ringing outside. With my microphone I moved between these two places, the interior billowing with waves of mighty organ, and the outside alive with the sounds of the square, its bells, bicycles and birds, the sonorous shuffle of people living their lives” (liner notes, 2005). Here, the instrumental performances in different locations form a series of stopping points along the way, reminiscent of the type of punctuated daily structure developed in the travel journals of the famous haiku poet Basho (2005). The sound pilgrimage forms a bridge between soundwalking practice and instrumental performance. The ecological analysis of the absolute or relative character of fissures in the urban network, of the role of microclimates, of distinct neighborhoods with no relation to administrative boundaries, and above all of the dominating action of centers of attraction, must be utilized and completed by psychogeographical methods. The objective passional terrain of the dérive must be defined in accordance both with its own logic and with its relations with social morphology (Debord 1958/2006). Corringham links her work as well with the long tradition in Britain of rural walking as a public right of way (see also Whitehead 2006). Paths are maintained that cut across private lands, providing access for walkers throughout the country. In her project “Shadow walks”, Corringham asked people to show her walks that were personally meaningful. She would walk with the person and record their conversation during the walk, then go back along the same route alone, attempting to get a sense of the place they had walked through. Then she would sing what she felt using wordless improvisations. The sound pieces produced from this process integrate singing, narration and the sounds of the place. The relationships of shadows to subjects mirror the links between songs and spoken words, environmental sounds and the people who hear them, and present walks with earlier iterations. Corringham takes a number of approaches to the showing of this work: “Shadow-walks have been disseminated as audio-walks through which other people could follow the route and add their own traces and memories, as listening posts at public spaces in a town, or in an art gallery via headphones, along with objects found on the street while walking” (Corringham 2010). After this project, Corringham moved to Rochester in the United States. She found in that city there were very few people walking on the streets, and discovered that they were walking at the mall. She has continued her shadowing project in this kind of location, trying to understand the process of mall walking through participating in it and creating sound work out of that experience. The term audio walk is used by artists Janet Cardiff and George Bures Miller to describe their guided narratives inspired by film noir. While some writers refer to these narratives as soundwalks (see for instance LaBelle 2006 and Licht 2007), this term is not used by the artists themselves, who link their work more with audio production than with sound. Audio walks share with soundwalks their emphasis on sonic experiences of particular places, but there are some significant differences in conceptualization and practice. Cardiff and Miller’s first audio walk was Forest Walk, completed while Cardiff had a residency at the Banff Centre for the Arts in 1991, where many Canadian sound artists including Hildegard Westerkamp have also worked, so they were likely aware of soundwalk practices. But in the monograph The Walk Book, written by Miriam Schaub in collaboration with the pair and giving a detailed introduction to their work, audio walks are situated in relation to museum and tourist tours rather than to soundwalks or soundscape art. The focus of audio walks is not acoustic ecology but rather the creation of a directed narrative using environmental sounds as a base or ambient track, as in a film soundtrack. There are frequent references to film culture in writing about audio walks. Schaub refers to the work as physical cinema, and says that Cardiff “creates a soundtrack for the real world” (25). This emphasis on the created or imaginary world superimposed over real world sounds differs from acoustic ecologists’ desire for listeners to pay attention to the sounds of the environment for their own intrinsic qualities and social meanings. In audio walks, sounds recorded on site are layered with a dramatic monologue by Cardiff which is forefronted in the mix (again like a film soundtrack) and accompanied by sound effects and music related to the narrative. Listeners walk through the site wearing headphones. The walks encourage slippage between the real environment that the listener walks through and the imaginary environment created and directed by Cardiff and Miller. The relationship with the audience is one of intimacy and direct authority, since Cardiff tells audience members exactly where to walk, controls pacing by asking listeners to match her footsteps, directs attention to particular visual and haptic features of the location, and suggests lines of thought or inquiry. Environmental sounds feature prominently at times in the soundtrack but the main focus of attention is the voice and its narrative flow. The audio walks have the flavor of murder mysteries, speaking of missing persons and murders, thus sometimes inducing a state of anxiety in the listener. These walks also include references to local history and contemporary news, as in the New York Central Park walk, Her Long Black Hair, which asks listeners at one point to consider Cardiff’s interpretation of a news photo of an Iraqi father whose three daughters were killed by a bomb. Marla Carlson describes how this strategy works with cultural memory during the audio walk: “Cardiff has shifted us a step further, from memories of a single, historical act of violence with broad cultural resonance to the ongoing, wide-ranging violence of the war in Iraq that many of us screen out in order to proceed with everyday life” (2006: 404). Carlson writes evocatively of how at this moment, other images and memories of reported war and murder come together in her experience of the walk. Another walker-writer comments on how Cardiff’s walk integrates experience by synesthetically calling on all the senses (Gagnon 2007). By its emphasis on audio production of a directed and multi-layered narrative, the audio walk leads the listener into an imaginary world in which real sounds and architectural features blend into a mysterious narrative, drawing on that place. The Ground Zero Sonic Memorial Project developed by soundwalk.com in collaboration with NPR’s All Things Considered, is an award winning audio work that allows tourists to be personally guided through the area of Lower Manhattan where the World Trade Centre used to stand. Beginning at the front of St. Paul’s chapel it directs participants along the southern half of the site, ending behind the World Financial Centre Plaza. Over the course of just under 45 minutes one is asked to follow the voice of the narrator, author Paul Auster, as he leads one through cemeteries, busy streets, construction sites, corporate buildings, and urban parks. Along the way these environs are transformed for the audience by incorporating a variety of seamlessly edited and densely layered narratives, archived recordings, music, and environmental sounds that contextualize the areas history and memories. Described as a “sonic memorial soundwalk” this audio guide is intended to function as a way to cultivate specific cultural and collective memories around the atrocities which occurred at the site on September 11, 2001. I took the Ground Zero Sonic Memorial in the early spring of 2010 with two friends, Beth and Dan, in order to glean a deeper understanding of both the site, as well as how the audio work functioned as a soundwalk. No one in the group had ever been to New York, and all of us were curious about how this experience may better inform our conception of the events surrounding 9-11 as well as the current state of the site. We had bought the mp3 from the soundwalk.com website and experienced it by listening through an ipod and headphones. At the beginning of the guide Paul Auster thanks the participants for “joining (him) on this Sonic Memorial Soundwalk”, an interesting choice of words considering the form, content, and relationships that are developed through the audio. One of the first qualities of the work to be noticed by all three of us was the pacing, which was 70-75 beats per minute. The pace was often acoustically timed out by a metronome that accompanied much of the music, and would set a sense of rhythm for the site. The problem here was that it did not leave enough beats, or steps, to completely traverse from one point to another in an attentive manner. With such a lack of time between the points of interest we found ourselves continually rushed to keep up with the instructions, walking against the beat provided, while often reaching the “soundwalk locations” 10 to 15 seconds too late. This made for a sense of mild anxiety and frustration for everyone in the group, as we had to often rush forward and passively listen while navigating the space rather than be attentive to the new environment surrounding us. The content of the instruction had a deep impact on the experience of the place as well. Whereas many soundwalk practices include discussions at the beginning of the walk in terms of etiquette and various strategies for active listening, the instructions for this work come through the narration and commanded the participant as to where they can go and when, binding them into the piece, and demanding their attention the entire walk in order for the work to be executed properly. This affects the individual’s experience of the place as they are not open to informing their own understandings of the environment, but are consistently told what to think. The effects of this narrative may also be understood in relation to how pronouns are incorporated to address the audiences relationship to the work and the space. When delivering a personal story about the WTC, the storytellers always uses the personal form of I. The narrator introduces guests as they, puts in his own experiences, and will make statements involving a we. One of the few examples of this we is right at the beginning of the walk when Paul Auster states “We came together after September 11th, 2001; radio producers, artists, construction workers, bond traders, secretaries, archivists, widows, fire fighters…”, but nowhere does he mention the participants current “coming together” with the work, events, and space. At the end of the work he also states “we all knew this could happen, we have been talking about the possibility for years…” Again, one could ask if Auster is including the audience as part of this “we”, or if it is a specific type of New Yorker, which the audience as tourist is most likely not. The only time that the participants are actually addressed is when they are given explicit instructions on where to go and when. It should be mentioned that this is not the way that all audience members have experienced the piece. Marla Carlson states that the Ground Zero Soundwalk: “…. is one of a number of ways to actively remember and restage this locale…. The Soundwalk gave me new memories of a place for which I never had any particular fondness.” (Carlson 2006, 414). For Carlson the engagement of the audience with these narratives in the space where the event took place allows for us to understand others memories while creating our own. I would tend to wonder what the quality of these experiences actually are. Though this audio work does engage the audience with others memories, I found that it allowed little space for the participant to reflect on their understandings of the tragedy surrounding 9-11, let alone any contemporary conception of what the site may be able to communicate to us about what these memories may mean to us today. A listening guide is similar to an audio guide in its use of headphone delivery and regulated pacing. But the emphasis shifts from audio production values to a focus on listening strategies. Lisa Gasior’s “Sounding Griffintown: A Listening Guide of a Montreal Neighbourhood” (www.griffinsound.ca) incorporates soundscape recordings with interviews of former Griffintown residents and imagined sounds of the past to create a sense of the competing claims of history through everyday story-telling. This former residential neighbourhood was changed to an industrial area in the 1960s and the listening guide gives an eerie sense of the residential past in the industrial present. The listening guide draws attention to conflicting ideas of truth and the workings of memory. The voice of the narrator (Gasior) stays in the background as the histories and mythologies of the area are recounted by former residents. The focus of narrative voices shifts from that of experts to competing claims on truth and memory, where different voices contradict each other. This approach to soundwalking can be situated in between art and documentary in its consideration of ideas about truth, memory and representation in the oral histories of the former residents. While voices are central to an understanding of the Griffintown listening guide, Gasior asks the listener to maintain contact with the sound environment by pausing the narrative at street corners, and telling the listener to remove the headphones from time to time in order to listen more closely to contemporary sounds of the environment, forming a bridge between history and current concerns. Another contemporary approach to online place-telling with sound is through the development of sound maps with instructions for public uploading, which have been established for several areas including New York city, Berlin, Aberdeenshire, Montreal, Toronto, Cologne, Minnesota and many other sites. These sound maps are often linked to pages describing the approaches of soundwalking, psychogeography and Situationism, as well as practical guides to working with GPS systems (see http://www.nysoundmap.org for a particularly good list of resources). Sound maps provide access points for people interested in field recording to upload sound experiences to a common interface, providing the possibility for exchange and collaboration without the gate-keeping of gallery sites. Soundwalk recordings and pieces made from them are included on these sites which also include examples of other types of field recording. The practices discussed here take very different approaches to communication with audiences, style of delivery, methods of audio production and dissemination, and overall intention. Each soundwalk structures the experience of participants through the way the location is presented and the kind of dialogue that is facilitated. Westerkamp directs questions to her audience and asks them to reflect on their own experiences and understandings. The approach of Lopez challenges the perceptual understandings of sighted soundwalkers who must give up their ocular privilege and submit to the acoustic leadership of an unsighted companion. Throughout the Ground Zero soundwalk, the audience hears specific narratives by citizens and experts directly impacted by the collapse of the World Trade Center, and is told what this site meant for others, more than asked what it might currently mean for them. Janet Cardiff maintains a playful, seductive tone to her interactions with the audience, including reflective moments such as the one mentioned by Marla Carlson about the Iraqi family’s loss, but also instructions to walk backwards or wet the finger, or not to turn even while sonically being followed. In Viv Corringham’s shadow walks, the participants are asked to remember a personally meaningful story, and to recount it. This recounting, combined with Corringham’s vocalizations and the objects she gathers from the site, provides several layers of meaning and possible reflection to gallery visitors, who are encouraged to walk the route themselves gathering objects and reflecting. The fact that the objects collected are often trash adds a layer of environmental awareness that extends beyond the sonic. There are also a number of questions raised by these divergent practices about the relative importance of different sound sources in the soundwalk experience and the way it is produced for audiences. More recent walk experiences, such as Cardiff’s audio walks, Gasior’s listening guide, and the soundwalk.com downloads, all integrate environmental sounds into a soundtrack about the place that is densely layered, often includes music, has a specific pace, and is directed by a vocal narrative. In the case of memorial soundwalks, this narrative is strongly emotional, drawing the attention of the walker even further. These walks are all intended to be listened to on headphones, which creates a sonic bubble around the listener, giving them the privilege of privacy and anonymity. Where tour groups often make tourists an obvious outsider in the spaces they visit, the audio guide, once purchased for download and accessed with the accompanying Iphone application, can be consumed personally, not drawing attention to the individual. This allows for the participant to blend into the environment that they are led through. At the same time headphones insulate and isolate the participant from the actual sound environment. There can be less concern for the sound environment where the walk is taking place. Whereas Gasior and Cardiff include moments for the audience to interact directly with the sound environment, there are no points of silence within the Ground Zero walk to listen to the present sound environment. The continual narrative, often contextualized with archived material and music, make the site a place of history, but does not focus on its present incarnation for the participant. This allows for the audience to become aware of the tragedy of the area, but limits reflection about current issues that may be occurring. By cutting off the acoustics of the space from the individual, and replacing it with post-production works layered with narrative, music, and foley, the experience of the space becomes more cinematic, taking it closer to the realm of entertainment or a simulacrum, with a focus on the walker as consumer of a packaged experience. While contemporary soundwalking practice includes highly produced soundwalks such as these, other recent approaches include sites such as the New York sound map and other websites devoted to soundwalking methodologies which leave the responsibility of choice of location, design of the walk, and style of recording and production practices completely up to the participant. Installation work is a third stream of soundwalk practice that includes evocative productions as well as suggestions about soundwalking methods, and is often linked with public soundwalk events. Soundwalking retains its dual roles in artistic creation and research. Contemporary work on soundwalking as a research methodology is being carried out at several international sites. At CRESSON, Nicolas Tixier, in collaboration with Nicolas Boyer and under the direction of Jean-Francois Augoyard, has developed an approach that he describes as “qualified listening in motion.” In this method, participants in urban settings are recorded walking through an area that they know well while commenting on the sounds that they hear. Tixier notes that this research method encourages a particularly fluid and open relationship between soundscape researcher and participant (Tixier, 2002). Soundwalking is being used as a primary research method by an interdisciplinary group at the University of Salford in the UK, under the name Positive Soundscapes. This group considers soundwalking a useful approach to bring professionals of different disciplines together in a common activity, in which information can be shared with less disciplinary boundaries. This group notes the importance of successive soundwalks as a way to develop a map with acoustic features. This historical approach of developing an ongoing soundwalk practice, with possibilities for sustained methodological research, is being investigated in other research creation projects as well. The Vancouver New Music Society has instituted a regular season of soundwalks as part of the new music offerings in that city. As a result, the Vancouver Soundwalk Collective has formed in Vancouver, who are meeting on a regular basis to explore and produce various approaches to soundwalking, thinking about issues such as collaborative leadership. 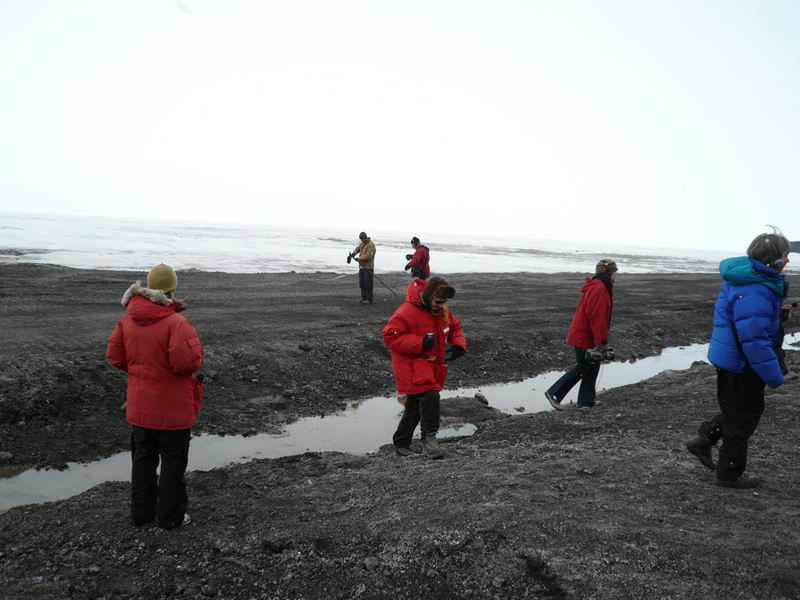 Andrea Polli has integrated soundwalks into her geosonification work, most recently in Antarctica (2009). In Montreal, the Journées Sonores: canal de Lachine project used the recording of individual soundwalks and commented walks by local residents, as well as public walks followed by reflective discussions, and the development of an interactive installation, as research methods to think about the changing sonic environment in an urban area over a time of significant change, as a disused industrial canal formerly known as the birthplace of Canadian industry was re-opened to public recreational traffic (McCartney 2005). Tia Kramer’s photo of Antarctic recording soundwalk led by Andrea Polli. Soundwalking has established a substantial role in contemporary sound research as well as artistic practice. The influence of soundwalking also extends beyond sonic research into suggested methodologies for the social sciences. A recent article in Qualitative Inquiry suggests soundwalking as a method to initiate contextually sensitive interviews (Hall et al 2008). As an artistic practice, contemporary soundwalking has been interpreted in a number of different ways, many of which have been discussed in this article. However, because these practices are proliferating widely and broadly, there are likely many other approaches to soundwalking. The reader is encouraged to use the sites and readings listed in the text and in the bibliography below as starting points for soundwalks of their own devising. The author wishes to thank the Quebec FQRSC – Fonds de recherche sur la société et la culture for their support of this research. Thanks to the readers and editors of this work for their close reading and incisive editorial suggestions, and to Hildegard Westerkamp, Ellen Waterman, Nimalan Yoganathan, Rainer Wiens, David Paquette, Samuel Thulin and Andrea Polli for commenting on early drafts of this article. The assistance of Marc Griebel was invaluable at the editing stage. Augoyard, Jean Francois. Step by Step: everyday walks in a French urban housing project. Foreword by Francoise Choay; translated and with an afterword by David Ames Curtis. Minneapolis, MN: 2007. Originally published as Pas a Pas: Essaie sur le cheminement quotidien en milieu urbain, Editions du Seuil, 1979. Basho, Matsuo. Basho’s Journey: The Literary Prose Of Matsuo Basho. Rochester, NY: State University of New York Press, 2005. Translated by David L. Barnhill. Baxter, Annie. “The Art of Mall Walking,” Minnesota Public Radio, 29 March 2005. http://pedestrianculture.blogspot.com/2005/07/art-of-mall-walking-viv-corringham.html. Accessed Nov 6, 2008. British Educational Communications and Technology Agency. ICT Advice: Using web-based resources in primary music: Soundwalk. Coventry, UK: 2003. Accessed online: HYPERLINK “http://www.mmiweb.org.uk/publications/webprimary/music.pdf&#8221; http://www.mmiweb.org.uk/publications/webprimary/music.pdf. March 2010. Cage, John. Silence. Cambridge, Mass: M.I.T. Press, 1961. Carlson, Marla. “Looking, Listening and Remembering: Ways to Walk New York After 9/11” Theatre Journal 58 (2006): 395-416. Chatwin, Bruce. The Songlines. London, UK: Pan, 1987. Corringham, Viv. “Shadow Walks.” HYPERLINK “http://vivcorringham.org/shadow-walks&#8221; http://vivcorringham.org/shadow-walks and http://www-fofa.concordia.ca/econtact/11_4/corringham_shadowwalks.html. Accessed March 29, 2010. Debord, Guy. “Théorie de la dérive.” Internationale Situationniste #2 (Paris, December 1958). Situationist International Anthology (Revised and Expanded Edition, 2006). Translated by Ken Knabb. Online at: http://www.bopsecrets.org/SI/2.derive.htm. Accessed December 8, 2008. Feld, Steven. “From Schizophonia to Schismogenesis…” In Music Grooves, edited by Charles Keil and Steven Feld. Chicago: The University of Chicago Press. 1994: 257-289.
de Certeau, Michel. The Practice of Everyday Life, trans. Steven Rendall, University of California Press, Berkeley 1984. Friedman, Ken. “Events and the Exquisite Corpse.” The Exquisite Corpse: Chance and Collaboration in Surrealism’s Parlor Game. Edited by Kanta Kochhar-Lindgren, Davis Schneiderman, and Tom Denlinger. University of Nebraska Press, Chapel Hill NC, 2009, 49-82. EContact! 4.3 Promenade Sonore/Soundwalk. Canadian Electroacoustic Community. April 2002. Text, still images, sound. http://econtact.ca. Freire, Paulo. Pedagogy of Hope: Reliving Pedagogy of the Oppressed. New York: Continuum, 1994. Gagnon, Monika. “Janet Cardiff.” Senses and Society 2 (2), 259-264. Gleber, Anke. The Art of Taking A Walk: Flanerie, Literature and Film in Weimar Culture. Princeton, NJ: Princeton University Press, 1999. Hall, Tom, Brett Lashua and Amanda Coffey “Sound and the Everyday in Qualitative Research.” Qualitative Inquiry. 2008 (14). 1019-1040. Kreutzfeld, Jacob. “Ishibashi Soundscape: Investigating the Soundscape of Urban Japan.” Studies in Urban Cultures Vol. 8, pp.88-99. 2006. Kubisch, Christina. “Works with Electromagnetic Induction.” http://www.christinakubisch.de/english/klangundlicht_frs.htm. Accessed March 3, 2009. LaBelle, Brandon. Background Noise: Perspectives on Sound Art. New York: Continuum, 2006. Licht, Alan. Sound Art: Beyond Music, Between Categories. New York: Rizzolli, 2007. Lopez, Francisco. “Blind City”. Champs Libres, Montreal. Invisible City. HYPERLINK “http://www.champlibre.com/citeinvisible/uk/participants/pagetype.php?rubrique=inst&ssrub=1&fiche=063&#8221; http://www.champlibre.com/citeinvisible/uk/participants/pagetype.php?rubrique=inst&ssrub=1&fiche=063. Accessed March, 26, 2010. McCartney, Andra. “Reception and Reflexivity in Electroacoustic Creation.” Electroacoustic Music Studies Conference, Sorbonne and INA/GRM, Paris, France. June 6, 2008. McCartney, Andra. “Performing soundwalks for Journees Sonores, canal de Lachine.” Performing Nature: Explorations in Ecology and the Arts. Edited by Gabriella Giannachi and Nigel Stewart. Bern, Switzerland: Peter Lang. 2005: 217-234. McCartney, Andra. Sounding Places with Hildegard Westerkamp. Electronic Music Foundation. 2000. Text, still photos, scores and graphics, sound. http://www.emf.org/artists/mccartney00/. Accessed March 30, 2009. McCartney, Andra, and Sandra Gabriele. “Soundwalking at Night.” Paper presented at Night and the City. McGill University, Montreal, QC, March 15, 2001. McDowell, Linda “In Public: The Streets and Spaces of Pleasure.” in Gender, Identity and Place: Understanding Feminist Geographies. Minneapolis: University of Minnesota Press, 1999: 148-169. Piper, Adrian. Streetwalk/Streettracks I-II (1969). Accessed at the Adrian Piper archive. http://www.adrianpiper.com/art/sound.shtml, August 18, 2008. Polli, Andrea. “Sonic Antarctica: Soundscape, Geosonification and the Social Geography of Global Climate Change.” Paper presented at World Forum for Acoustic Ecology conference, Mexico City, March 2009. Rosaldo, Renato. “Ideology, Place, and People without Culture.” Cultural Anthropology 3 no. 1, 1988: 77-87. Schafer, R. Murray, editor. Vancouver Sound Diary. Vancouver: ARC Publications, 1977a. Schafer, R. Murray, editor. European Sound Diary. Vancouver: ARC Publications, 1977b. Schaub, Mirjam. Janet Cardiff: The Walk Book. Edited by Thyssen-Bornemisza . Koln: Koenig, 2005. Schroer, Oliver. Camino liner notes. Borealis Records, 2005. http://www.oliverschroer.com. Schwartz, Tony. The Responsive Chord. New York: Doubleday, 1974. Thich, Nhat Hanh. The Long Road Turns to Joy: A Guide to Walking Meditation. Parallax Press, 1996. Revised edition. Thompson, Emily. The Soundscape of Modernity: Architectural Acoustics and the Culture of Listening in America, 1900-1933. Cambridge, MA: MIT Press, 2002. Thoreau, Henry David. Walking. Applewood: Bedford MA (Concord), 1862. Tixier, Nicolas. “Street listening. A characterisation of the sound environment: the ‘qualified listening in motion’ method.” Soundscape Studies and Methods. Edited by Helmi Jarviluoma and Gregg Wagstaff. Turku: Finnish Society for Ethnomusicology, 2002: 83-90. Wagstaff, Gregg. “Soundwalks.” Radio Art Companion. Toronto, ON: New Adventures in Sound Art, 2002 (a). Wagstaff, Gregg. The Touring Exhibition of Sound Environments. British Library Archival Sound Recordings. http://sounds.bl.uk/View.aspx?item=022M-1SS0002815XX-0200V0.xml. Accessed March 3, 2009. Westerkamp, Hildegard. Transformations. CD. Montréal: empreintes DIGITALes, 1996. Westerkamp, Hildegard. “The Soundscape On Radio.” In Radio Rethink. Edited by D. Augaitis and D. Lander. Banff, Alberta, Walter Phillips Gallery, 1994. Westerkamp, Hildegard. Lighthouse Park Soundwalk. Econtact! 2002 Soundwalk issue. Canadian Electroacoustic Community. HYPERLINK “http://cec.concordia.ca/Radio/Long/Westerkamp.html&#8221; http://cec.concordia.ca/Radio/Long/Westerkamp.html. 1977. Westerkamp, Hildegard. “Soundwalking.” Sound Heritage 3 no. 4, 1974: 18-27. Republished in Autumn Leaves, Sound and the Environment in Artistic Practice, Edited by Angus Carlyle. Paris: Double Entendre, 2007. Whitehead, Simon. Walking to work. Abercych, Pembrokeshire, Wales: Shoeless, 2006. Exxon Valdez. Toronto: Between the Lines, 1998.